Britain is becoming less trusting and beginning to question news outlets, as a consequence, we are changing our paper preference, according to new research. The Hitwise study, based on 3 million online UK consumers, reflects the shift in the British public’s media consumption due to the impact of today’s political landscape. It found that 1 in 9 online visits were made to News and Media sites in 2016, a rise on the previous year reflecting the heightened political climate in the UK after Trump and Brexit. The Hitwise data indicates the public are not only consuming more news across broader sources, but are now beginning to question the role that news providers play in the current environment and beginning to change their preferences of media titles. The Hitwise data reveals in 2016, one in nine visits online were made to News and Media sites, compared to 2015, where every one in ten visits were to these sites. The Hitwise research also found the British public are spending, on average, 5:04 minutes per session on Print Media websites, these findings, however, largely vary between publications. For example, out of the top twenty-five print publications, based upon visits share, times ranged from 7:48 minutes on the Daily Mail, down to 3:06 minutes on Forbes. 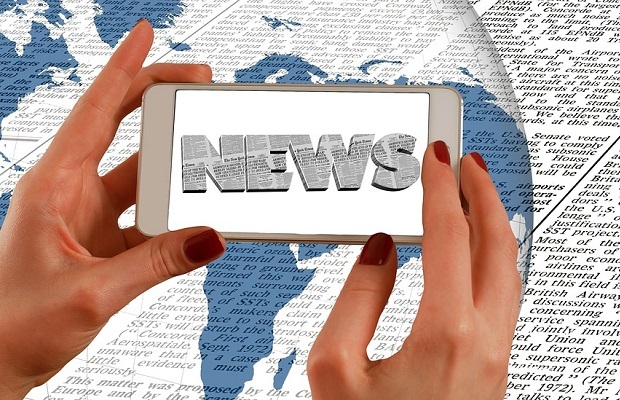 It is not surprising that politics has been dominating media headlines and will continue to do so over the course of the year. 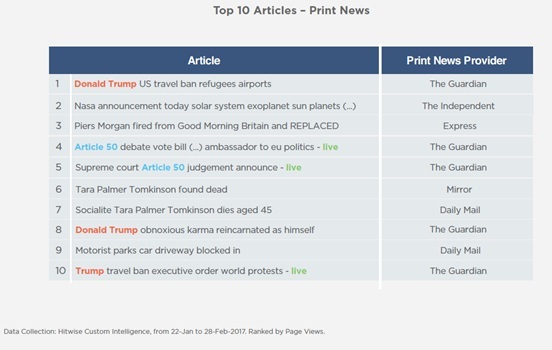 In fact, articles focusing on Trump and Brexit accounted for five out of the top ten read articles, based on total page views, in January and February 2017. These same political events have begun to blur the lines between audiences of traditional right and left-leaning online media publications. 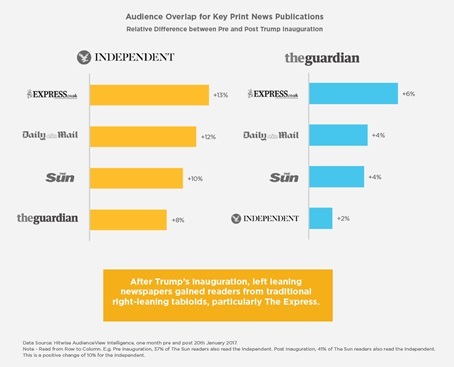 Comparing our data, the month before and after Trump’s inauguration, left-leaning newspapers such as the Guardian and The Independent have gained readers from traditional right-leaning tabloids, such as The Sun, Express and Daily Mail. The Hitwise research further indicates how popular news topics change depending on publication day and time. When analysing the top five news topics during the week, compared to the weekend, our data showed that news about the UK eclipses all other topics, peaking between 4-6pm on weekends, compared to 12pm-7pm on weekends, as highlighted in the graphs below. 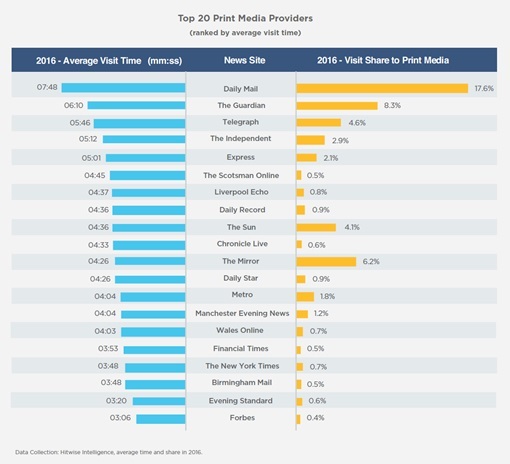 The UK’s hourly news consumption also shifts with breaking news stories. For instance, although on the day of Trump’s state visit debate the Daily Mail received the highest traffic volume out of all online newspapers, the Guardian won share over their Trump coverage in the early morning and late evening. This was predominantly the result of two key articles – Trump’s claim on the Swedish terror attack and parliamentary state visit debate. Hitwise recently announced the company’s new ability to track data on an hourly basis. The higher frequency means that clients can more quickly modify their ad campaigns or their content choices based on real-time actionable insight. The full report, News in 2017: A Digital Marketing perspective, can be downloaded here for further insights.